You might imagine that here at Ferguson TV, we very much live ‘for the moment’ to provide the most up-to-date and sophisticated TVs – and we do. Our Platinum TVs, for instance, represent the latest in Android smarts and exceptional visual and audio quality, representing a true all-in-one solution for all manner of homes. However, we are also very proud of our long heritage as one of the leading TV manufacturers in the UK, dating back to the 1940s. We therefore thought we’d take you on a quick tour of the ups and downs of the Ferguson TV story. Ferguson is one of the UK’s most legendary and longest-lived electronics brands, alongside the likes of Ultra, Pye, Bush and Dynatron. However, it actually started life in the early 20th century as an American-Canadian company, producing radio sets for the UK market that were based on American models of the time. Only after the Second World War did Ferguson become a fully-fledged British firm, named Ferguson Radio Corporation. The company manufactured radio receivers and later branched out into televisions, and it’s fair to say that even back in those days, there was a big emphasis on quality. By the early 1960s, Ferguson was offering an impressively comprehensive range of TV and audio equipment, while new products in the 1980s included personal cassette players, CD players and video recorders. However, the last few decades of the century were trickier ones for Ferguson amid intensifying competition from foreign brands. It culminated in the sad closure of Ferguson’s factory in Gosport, Hampshire on 20th February 1992, seemingly bringing an end forever to the brand’s proud history of British manufacturing. Ferguson’s presence in the UK market appeared to have finally come to an end in 2012. But that hasn’t turned out to be the case, as Ferguson has now made a roaring comeback with the help of another proud British firm, Cello Electronics UK Ltd. 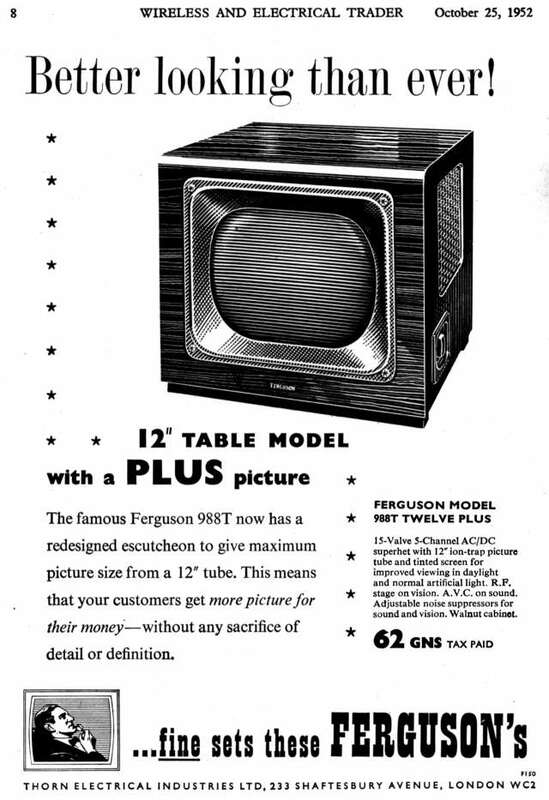 Even better news is that Cello’s production facility is in County Durham, England so Ferguson TVs are once again being produced right here in the UK – making a modern Ferguson TV very much the patriotic choice as well as the sensible one! Purchase a Ferguson TV today such as the Platinum with its built-in multi-speaker soundbar and air mouse remote control, and you can play your own part in continuing the success story of one of the most celebrated TV manufacturers in the UK.